Unfortunately my holo NOTD chipped pretty quickly so I decided to change my polish to something bright because Spring is in the air yay! I was in Kinokuniya bookshop on Sunday and I came across the latest edition of Nail Up! (which I'm regretting not buying my 1st copy now as the exchange rate made the price actually reasonable) and the cover girl had a mani with red polish, rhinestones and dazzlings and stripes on other fingers. I can't find a photo of the cover unfortunately but I was totally digging the red with the rhinestones. I haven't done red for a while so here is my version going from what I remember! 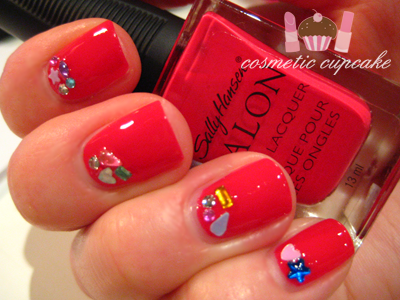 I started off with Sally Hansen Salon Nail Lacquer in Cherry Nice . I picked this up for a steal at my local Chemist Warehouse which always seems to have loads more beauty goodies on sale compared to others I check out. I don't have very many Sally Hansen polishes as they are waaaaaaay overpriced down under so I was very happy to stumble across this bargain. I found it right after my workmate lent me Revlon Cherries in the Snow which was perfect because I wanted a cherry red for my collection! Cherry Nice is a gorgeous cherry red creme. I am very impressed with this polish! It is super duper pigmented - 1 coat would have been enough for full coverage but I did 2 which is pictured below as I wanted the colour to be more vibrant. It applied very smoothly and it dried to a glossy finish. The brush was easy to use but it was kind of small for my liking, I would have preferred it to be wider so I wouldn't have to do so many strokes. I then applied various rhinestones and dazzlings which I got from various swaps and also from Viva La Nails using clear nail polish. Then topped it off with a thick coat of Seche Vite! What do you think? I am so thinking of going to the city after work to buy myself Nail Up! but I have a paper due on Monday which I need to do =( Decisions decisions! I want to quickly thank the lovely Ronnie for mentioning me in her latest video about beauty gurus and bloggers that she wants to bring together. Thank you for the sweet words hun! Check out her Youtube channel here! Such a simple concept and it looks just wonderful! Such a cute way to dress up a colour! This color is amazing, plus I'm loving the name! This is so pretty! The red is just gorgeous.. It seem that you do not have any problem with this formula. I don't know why I have so much problem for this type of nail polish. Specifically this Sally Hansen nail lacquer. I have 4 polishes of this line of SH. I don't know if mine are fake or not, but 2 of the polishes are super streaky. May be it might be fake because I bought them all at Dollar Tree, but I never encounter any fake products at DT before. What truly worse is that all of them take forever to dry. It took me nearly 15 min for the first coat. And if I am doing a nail art, layering on the coats will take forever, sometimes, I went to sleep and the next day it dry with wrinkling finish because I did not keep my hand straight. May be this require a good drying topcoat, but it would be nice if the nail lacquer have the right formula without the need of topcoat. @Dhini: It's a wonderful red polish. Glad you like the nail art! @JQ: Thank you so much! It didn't take long to do either which is bonus =) Thank you for stopping by my blog and commenting. @Freshie: I'm a sucker for cherry anything really so when I saw this polish I just had to have it! @Alice: It's a great colour to brighten the day! I love red polishes so much and this has got to be a favourite now. This polish looks great on short nails too! I did my workmates nails today with this colour and it looked fantastic. But as you say it'd be perfect for a pedicure too! i love this color i'm about to do a post on it its such a goood pretty color!!! @ngocupham: Hi! This is the only colour I've tried from range of Sally Hansen so I can't compare, but it may have to do with the colour of the polish. Also other factors such as what base coat your using, whether you're waiting in between coats, how old the polish is etc. We don't have Dollar Trees in Australia so I can't give you any advice in regards to authenticity. It is a real problem that they take so long to dry! Perhaps use a quick dry topcoat like Seche Vite? 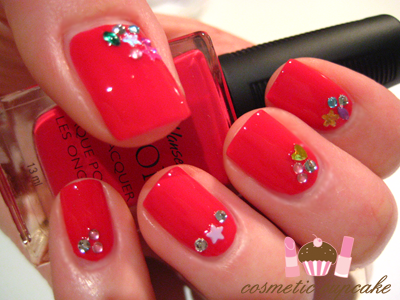 I love the color of the nailpolish, also with the rhinestones it looks lovely!! P.S. Checkout my two winner giveaway!! @Abigail NY: It's an awesome red polish. Glad you like the colour!